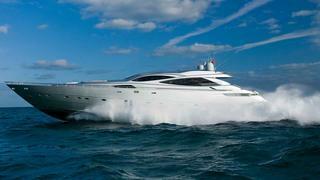 The 35.4 metre motor yacht Carcharias has been sold with Burgess representing the seller and buyer. Designed by Fulvio De Simoni, she was built in GRP by Italian yard Pershing to RINA class and delivered to an experienced owner in 2007. A custom interior by Winch Design uses light wood joinery and cream leather furnishings to create a calm, relaxing ambience accommodating up to seven guests in three generous cabins. These consist of a master suite, a VIP suite and a twin cabin with a Pullman berth, all with entertainment systems, television screens and en suite bathroom facilities. The main saloon is particularly attractive, offering comfortable seating, a bar and an entertainment centre including a 61 inch Pioneer plasma television screen. A further attraction is a dedicated cinema room boasting another 61 inch Pioneer plasma screen. The saloon also has a sliding roof to allow the sun to stream in and give the guests the illusion of dining al fresco. True al fresco entertaining and dining is available on the aft deck with built in upholstered seating, a table and weatherproof loudspeakers connected to the entertainment centre. A planing hull and an advanced propulsion system give her extraordinary performance. Twin 3,700hp MTU engines and a Vericor gas turbine are linked to triple water jets, producing 12,800hp of thrust and enabling her to cruise at 30 knots and blast through the water at a top speed of 52 knots. The water jets are unique in that the inlet ducts of the jets are an integral part of the hull moulding which gives a better water flow to the impellers and improves their efficiency.